The Ion Age Blog: October 2016 ends with a Patrol Angis AAR! As the month draws to a close it is my delight to present to you an excellent After Action Report (AAR) as a free PDF to download written by Aris Kolehmainen for Patrol Angis. 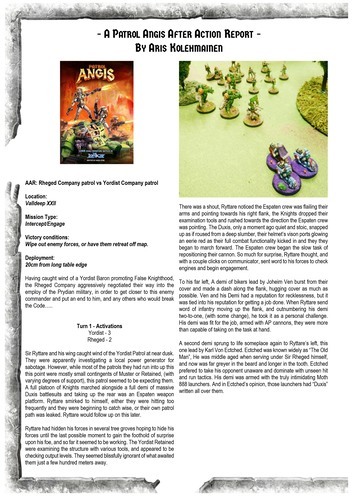 If you go back to the start of the month there was a Prydian Precinct article upon The Rheged Company and this post battle account features the Khamel Bike mounted knights of this company against the Yordist threat. You can download the article for free from our Dropbox by clicking HERE. Enjoy! Victory conditions: Wipe out enemy forces, or have them retreat off map. Having caught wind of a Yordist Baron promoting False Knighthood, the Rheged Company aggressively negotiated their way into the employ of the Prydian military, in order to get closer to this enemy commander and put an end to him, and any others who would break the Code. There were some comments on social media that there was no close up image of a Rheged Company biker Musterman so we have sorted that out for you and here it is! You can see the conversion work along with the excellent paint job that Aris gave his signature figures. The IAF028 Khamel Warbike. Last chance to get IMP38 Male Adventurer free automatically. He is a very versatile character who fits into any setting as a bounty hunter, a mercenary, a guard or anything else you would like. Standing 16mm tall and wearing rigid body armour while holding a large calibre semi-automatic Tumbler machine pistol and a sword he is a capable fellow. Withdrawn when the month ends and replaced (he will appear next summer once more as part of the Year Four collection). We have now made all of our releases for the month of October. So if you enjoyed the new Nox Ordos platoon pack (remember to ask if you want its unique miniature rather than IMP38) and being able to get Patrol Angis and Callsign Taranis as digital downloads plus the new IAF122 Prydian Xenobiologists pack you have now seen our month. Until the end of this month we have a special...time on one of the supporting packs for our mighty Taranis tanks..drones...we have 25% off the IAF082 Taranis Repulsar Drones for the whole month.